Alma and Dave hate each other. Alma is an environmentalist in charge of a project to restore the native habitat and wildlife of the Channel Islands National Park. Dave is the founder of an animal rights group who often seems to love animals more than he loves people. The Channel Islands are a group of small rocky islands off the coast of Santa Barbara, California, once used for sheep ranching, now a national park where the habitat is being destroyed by feral hogs and rats. 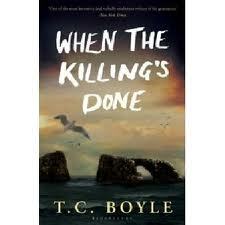 T. C. Boyle is the talented author who weaves an exciting and thought-provoking story out of these characters and location. The Channel Islands is a real place, whose isolation enabled it to develop its own unique species and habitat distinct from the mainland. Over the years it was subjected to a number of environmental disasters, including overgrazing by sheep ranchers, being overrun with rats coming ashore from shipwrecks, and herds of escaped hogs that went wild. Eventually the islands were acquired by the Park Service who saw an opportunity to intervene and restore some of the original ecosystem. This required tactics that did not endear it to animal rights groups. This book puts a spotlight on that conflict and causes us to think about the issues involved. What is the worth of a healthy ecosystem against the value of the lives of the invasive animals? What gives us the right to decide which animals should live and which should die? How do you distinguish man-made change from natural change? Environmentalists and animal rights activists are often thought to be in the same political camp. Alma and Dave are both vegetarians. They find themselves seated near each other at a concert, enjoying the music of the same folksinger. They go out on a date together. But their differences will propel them to a bizarre and dangerous confrontation. We go back in time to see the backstories of the characters and the forces that drive them into conflict. Boyle is a master at making his characters seem real. Many of them seem exactly like someone you know personally. They have doubts and bad days and thoughts and problems just like you and me. There is lots of adventure here too. Shipwrecks on the high seas. Cloak and dagger operations under the cover of darkness. Danger and suspense.